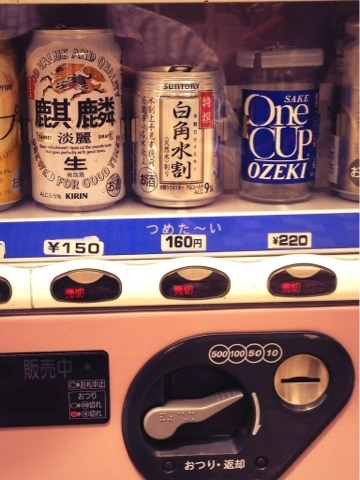 A typical alcoholic beverage vending machine in Fukuoka City, Japan. The red lights say "Urikiri" which means sold out. Vending machines are everywhere in Japan, their products various and humorous. Much like many other developed economies, convenience sells tremendously well. But something you won't see sold in many other countries is alcohol with vending machines. This is for obvious reasons: theft, underage drinking prevention, fire safety, the list goes on. In Japan alcohol is readily available all the time and any time you want it or in some cases need it. Consumption of alcohol is very common in Japan and some people are concerned about alcoholism being a source of many domesticated problems, but the fact of the matter is, even with the large amounts of alcohol being consumed in Japan, the crime rate per capita is extremely low, although strict regulation is now being enforced on drunk driving. Note that Tokyo is red surrounded by green and Fukuoka is around the middle range located in the most southern area of Japan (Kyuushuu). Kagoshima is the highest consumer of alcohol in Japan, also located in Kyuushuu. Okinawa is the small island located on the right. In regards to vending machines, most have been equipped with a taspo card reader that assures the purchaser is of age. The same goes for vending machines that sell cigarettes. Many foreigners find the lack of strict regulation on alcohol and tobacco a surprise, but in Japan most people are not worried about it at all. Alcohol and tobacco have their role in society and this is accepted despite their known negative affects on health. So if you like Japanese Sake, no need to worry about ever running out in Japan because there is always a place you can find it relatively close by.